President Trump’s decision to allow a small group of U.S. troops to remain in Syria has granted a small victory to senior Pentagon leaders and created a pocket of flexibility for them to navigate the controversial U.S. withdrawal that sparked the protest resignation of former secretary of defense Jim Mattis. The American troops are expected to form part of a multinational “observing and monitoring force” made up primarily of NATO allies. Joint Chiefs Chairman Joseph Dunford has been spearheading talks with allies to assemble that force, part of whose mission would be to monitor a Turkish-proposed safe zone in Northeastern Syria that is still a matter of delicate negotiations. Dunford told reporters Friday that he was “confident” that U.S. allies would now agree to participate in the ongoing presence. Since December, when Trump declared that the Islamic State in Syria had been “defeated,” the Pentagon has been buffeted in a maelstrom of competing interests as it has sought to carry out an order that few of its senior officials appear to support. 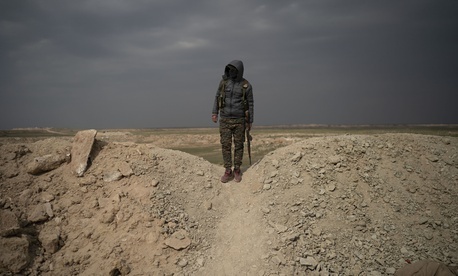 Several senior defense and intelligence officials publicly have warned that a precipitous withdrawal from Syria risked both the slaughter of the U.S.-allied Kurds by Turkish forces and fanning the embers of extremism in the war-torn northeast. After Mattis was unsuccessful in persuading the intransigent president to stay the course, he quit. His successor, Acting Secretary of Defense Pat Shanahan, and Dunford, have continued to carry out the withdrawal, faced with a timeline that at least publicly appears to have shifted several times. The president remained unequivocal that all U.S. troops would return home, while European allies have made it clear that they would not remain in Syria if the United States leaves. In Washington, Pentagon officials have faced pointed questions about the withdrawal from irate lawmakers who passed legislation opposing it. Meanwhile, the Trump administration is also trying to navigate the tense situation between two allies who consider themselves mortal enemies — Turkey and the Kurdish-led Syrian Democratic Forces, or SDF. “Our mission remains unchanged in terms of the defeat of ISIS,” said Shanahan on Friday, before he and Dunford met at the Pentagon with their Turkish counterparts, Defense Minister Hulusi Akar and Gen. Yasar Guler, chief of the Turkish General Staff. Shanahan said the allies were working “as strategic partners" toward a stabilization mission that supports local forces. While the drawdown of the around 2,200 troops in Syria continues, the Pentagon now has a little breathing room to manage the situation on the ground — and nervous allies — in Syria after the bulk of U.S. forces leave. A defense official told Defense One that the residual force will “enable the coalition to transition to the stabilization phase” in Syria, in part by “[helping] local forces to keep pressure on the remnants of ISIS and prevent a resurgence” of the group. White House press secretary Sarah Sanders created confusion Thursday by saying in a statement that about 200 hundred “peacekeepers” would remain in Syria — a term that has specific international law connotations under the UN Charter. But conversations with administration officials suggest that the use of the term “peacekeepers” appears to have been a mistake. The activities and authorization that officials describe the remaining troops undertaking do not fall under the legal rubric of a U.N.-chartered peacekeeping operation. Dunford in early December, before Trump’s abrupt announcement of the pull-out, described the stabilization phase of the strategy in Syria as primarily a matter of training local partner forces to maintain the security of the region themselves. Other officials last year, including USAID Administrator Mark Green and U.S. Central Command’s Gen. Joseph Votel, called for stability operations also to include helping Syrian’s to restart basic services, such as water and electricity. Trump long has said publicly that he wanted to “get out” of Syria. The afternoon of the withdrawal announcement, a senior administration official sought to explain the policy reversal in a hastily-scheduled press call by arguing that Trump himself has been consistent — but his swift and apparently unilateral decision nevertheless shocked both allies, GOP lawmakers on Capitol Hill, and, it has since emerged, senior leaders the Pentagon. Trump’s decision to allow a small group of troops to remain was heralded by Graham and other opponents of the withdrawal, but critics warned that it could herald a creeping metastization of the mission in Syria. Former Pentagon officials and outside analysts also argued that a few hundred troops is too small of a number to do have any meaningful impact on the ground. “Leaving behind 200 U.S. troops isn’t enough to do much other than get the United States entangled in a larger conflict,” said Benjamin Friedman, policy director at the conservative think tank Defense Priorities said in a statement. The Pentagon has given no timeline for the residual forces to remain in Syria.